I love fizzes. The most famous fizz, the Ramos Gin Fizz, was one of the first cocktails I completely fell in love with. This recipe is very similar to the Golden Fizz, except we are using the egg white instead of the egg yolk. Makes sense, right? 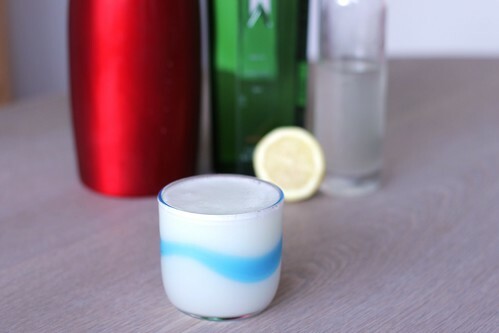 Lommebogen also adds a tiny bit of cream to this as well, which isn’t an uncommon thing (the Ramos Gin Fizz uses egg whites and cream). I’m curious to see if that has any real effect on the color or texture of the drink, especially since there is so little of it. This is a fine fizz. For Café Royal and Savoy recipes, I went with the Café Royal extra lemon juice, and sugar to taste for the second one. Either way this is a tasty drink. The Lommebogen with the cream did have a slightly better foam on top, so that’s a fine idea, though certainly not necessary.